The insurance industry, perhaps more than any other, is facing big changes and expecting big opportunities over the next few years thanks to digital transformation and innovation. At SAP, we know that true innovation doesn’t happen in a bubble – and it certainly won’t happen just by sitting at a computer. That is why we created SAP Next-Gen Innovation Tours, orchestrated by the SAP University Alliances program which opens up the world of SAP to 3,100+ educational institutions in 106 countries worldwide, including 96% of top universities. It aims to develop critical skills for the exponential enterprise among academics, university students, and young thinkers, and to build the bridge to digital futures for executives and professionals. To accelerate the impact of its global academic innovation network, SAP University Alliances has launched SAP Next-Gen to enable SAP customers and partners to seed in disruptive innovation and accelerate their exponential enterprise journeys and digital futures. As part of this effort, customers have opportunities to participate in SAP Next-Gen Innovation Tours to Silicon Valley, which are learning journeys to explore disruptive technologies and innovation in an open network through connections to SAP experts as well as academia, startups, accelerators, and venture firms in the SAP University Alliances innovation network. The first stop in Silicon Valley could be at the SAP Innovation Center and SAP AppHaus Palo Alto where you can speak with SAP experts about the innovation methodologies and technologies enabling the digital transformation of industries including insurance. SAP AppHaus Palo Alto is one of my favorite places and includes a dedicated design-thinking workshop area, design project rooms, and team working areas. The building also houses the SAP d-shop, a space that enables SAP employees, university students, and customers to explore how exponential technologies including the Internet of Things (IoT), Virtual Reality (VR), and other technologies are disrupting business models. I personally find the atmosphere here inspiring, and I know many visitors leave SAP AppHaus Palo Alto and d-shop feeling the same way. So far, I have been privileged to sit in on discussions ranging from IoT-connected cars and smart homes to details on how SAP solutions, including SAP HANA Cloud Platform, enable business to run live. We also can arrange a meeting with the SAP StartUp Focus program where you can learn how SAP is scouting, enabling, and mentoring startups on the SAP HANA platform, and how customers can connect with these startups to seed disruptive innovation. Every customer has different goals, and your SAP Next-Gen Innovation Tour can be developed to connect you with the best SAP experts for your company. You can also stop by the HanaHaus. 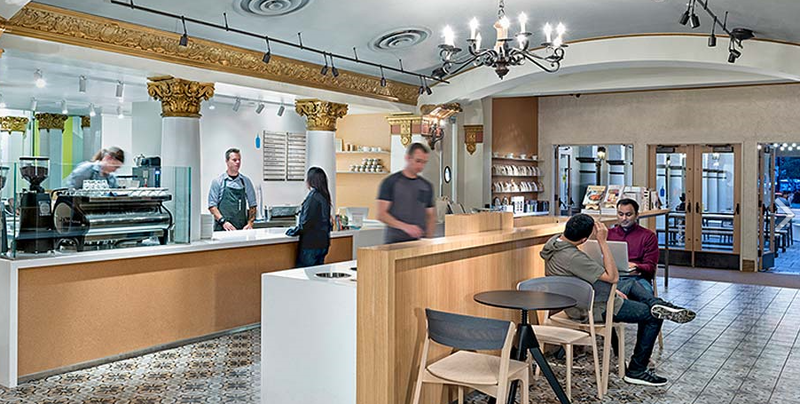 HanaHaus introduces a new space typology to downtown Palo Alto, repurposing one of the city’s beloved landmarks as a hybrid café, co-working, and public space. HanaHaus is a commons of purpose, comprising an array of gathering and co-working areas and events where creative individuals and entrepreneurs can meet, socialize, share ideas, connect with experts – and see their startups come to fruition. You can have an excellent cup of coffee here and meet the SAP co-innovation leaders discussing joint development opportunities. SAP customers who participated in the SAP Digital Insurance Innovation Summit in October 2016 had the opportunity to take advantage of a SAP Next-Gen Innovation Tour. This included meetings with SAP experts at SAP Labs Palo Alto, as well as thought leadership talks from faculty in the SAP University Alliances academic innovation network, including University of California, Berkeley, and Stanford University. Customers heard the latest thought leadership from academia on design, applied innovation, and advances in data science and deep neural networks. SAP Next-Gen Innovation Tours are exceptional opportunities for you to benefit from the existing relationships that SAP has with universities, startups, and tech community partners in Silicon Valley and around the world, and to explore ways you can accelerate your exponential enterprise journey and digital future. If you’re interested in seeing what kind of SAP Next-Gen Innovation Tour we can build for you, please contact Birgit Fien-Schmalzbauer birgit.fien-schmalzbauer@sap.com. Tours can be exclusive or grouped with other peers in your industry to promote collaboration.